​​HOUSTON – The average home in Houston currently spends about two months on the market before selling. However, homes in some neighborhoods can sell in half the time while homes in other neighborhoods can spend twice as long on the market, according to the Houston Association of Realtors (HAR). 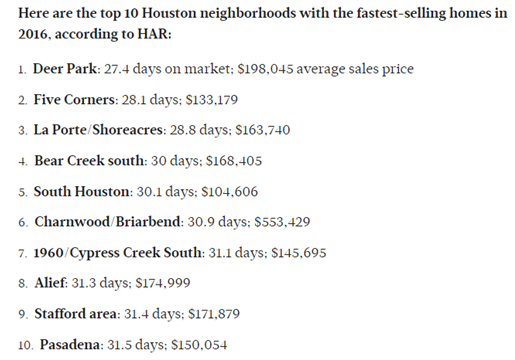 The Houston real estate organization released its 2016 home sales data, which looked at the average “days on market” in more than 150 submarkets across the Bayou City. Homes in Deer Park sold the fastest with the average home spending just 27.4 days on the market in 2016. Other east Houston suburbs like La Porte and Pasadena, near the petrochemical plants, also had fast-selling homes, according to HAR. ​Want mo​re data? See Houston Housing Market Research.